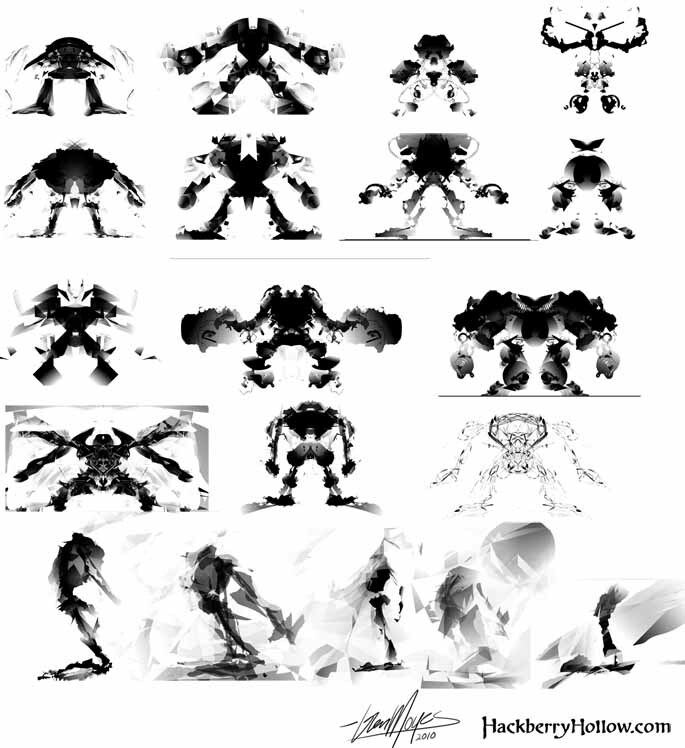 Here’s part 2 of what was posted last week regarding using Alchemy to aid in character design. I wonder what will happen when we take the new shapes and apply it to our original concept and rendering style? After the jump we’ve got some information on the process of how we take the random shapes and use that to create an actual design. Recently I’ve been researching and experimenting with a bunch of different techniques to help me design the characters of Hackberry Hollow. This week I’ve tried a couple of new things. The first one was sculpting characters to help me understand the 3D form to help me draw them, and the other is using a program called Alchemy which I used to create the above images. One of the time consuming parts of creating art is figuring out exactly what colors to use. That’s one of the reasons why color keys are important to us. Not only does it help us create a color script for the comic, but once we get into production all we have to do is eye-drop our color keys and just paint away. We can skip the usual color study phase of our process once we get into production because we’ve already done it for all the art in that scene once before.